Concept: This group represents early to mid successional hardwood Vegetation Types (VT) found mainly on zonal sites within the Acadian Ecosite group. Red maple, white birch, grey birch and aspens are the dominant species. Vegetation types cover a range of soil moisture and nutrient regimes due (in part) to the ability of hardwoods in this group to adapt rooting patterns to site conditions. Well developed shrub and herb layers along with reduced bryophyte/lichen cover are typical. These are generally short-lived, even-aged forests that result from stand-level disturbance events. Vegetation: Vegetation types are mainly closed canopy forests dominated by shade intolerant to intermediate hardwoods (red maple, white birch, grey birch, trembling aspen, large-tooth aspen, and to a lesser extent red oak and white ash). Overstory species occur in pure or mixed combinations, often with scattered residuals from the previous stand present. The shrub layer can be extensive with regenerating trees and typical woodland species such as wild raisin, serviceberry and honeysuckle. On poorer sites witch-hazel and ericaceous species will also be present. Herb diversity is usually high but variable depending on site conditions and overstory quality. Poorer sites will have bracken, mayflower and teaberry, whereas better sites will have species such as sarsaparilla, asters, goldenrods and grasses. The bryophyte layer is usually poorly developed. Environmental Setting: Vegetation types in this group are found on a range of sites – the most broadly defined group in the FEC system. 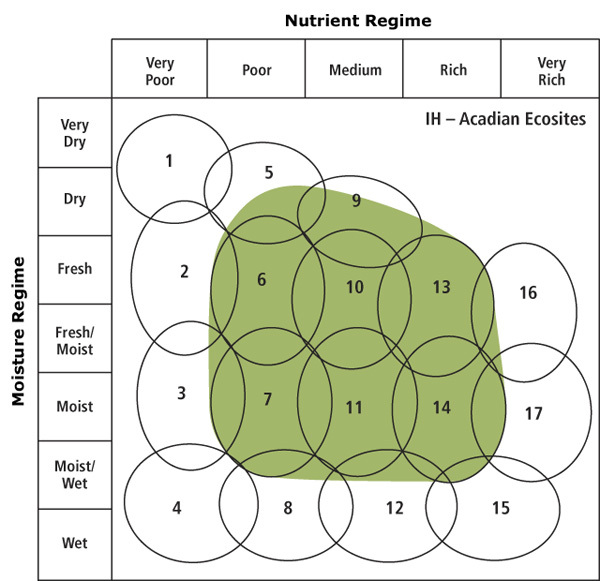 Moisture and nutrient regimes range from dry to moist and poor to rich. Soils are mainly derived from glacial till deposits. This group is found throughout the province as matrix forest or various size patches, although certain VTs are more ecoregion specific (e.g. red oak VTs in the Western (700) ecoregion). Successional Dynamics: This group is mainly associated with early successional zonal VTs, but some types are more edaphic in nature. Red maple on tolerant hardwood sites should be considered mid-successional. Where red oak occurs this species will continue to form a component of future successional stages due to its longevity. Seed dispersal and clonal/coppice regeneration are two effective strategies that allow intolerant hardwoods to quickly establish themselves in stands that have been disturbed by harvesting, fire, or windthrow. These species also serve as a protective layer as more shade tolerant, late successional species start to regenerate in the understory. Ecological Features: These are early to mid successional, small to large patch forests. Short-lived overstory species colonize sites rapidly after disturbance acting as a ‘nurse crop' for later successional species to develop in the understory. Many trees from this group can stump sprout and/or root sucker enabling stands to perpetuate after repeated disturbances. Sites with extensive ericaceous shrub and bracken cover usually occupy poorer sites, while better sites typically support well developed herb layers and frequent levels of white ash. Mature trees and stumps are prone to infection by shoe-string root rot, a widespread family of parasitic fungi. Regenerating stands provide important browse for deer, moose and snowshoe hare. Stands adjacent to streams are used by beavers to provide food and raw materials for lodge and dam building. Older stands may provide habitat for great crested flycatcher, grey catbird, yellow warbler, chestnut-sided warbler, common yellowthroat and ruffed grouse.